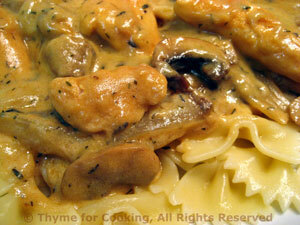 Chicken Stroganoff, from Thyme for Cooking's seasonal menus. One of my favorite chicken (and pasta) dishes. We'll finish the butternut squash on later in the week. Chicken breast, cut up and quickly cooked, makes a very tender meat for the Stroganoff. You may never go back to the traditional Beef! I break from tradition again, using Greek yogurt rather than the sour cream. Greek yogurt is thicker and creamier than regular plain yogurt, but lower in fat and calories than sour cream. Peel and vertically slice the onion into thick wedges. Brush any dirt off the mushroom and slice - trimming off the tough stem ends. Put flour and paprika into a medium food bag - large enough to easily hold the chicken. Mix the flour and paprika, then add the chicken. Shake to coat well. Heat 1 tbs oil in large nonstick skillet and sauté onions for 5 minutes. Add mushrooms and continue to sauté until onions are tender, about 10 minutes longer. Heat remaining 1 tbs oil in same skillet. Add chicken and sauté until golden, 3 - 4 minutes. Add chicken stock, onions, mushrooms, thyme and mustard to skillet, cover and simmer 5 - 7 minutes. Dissolve cornstarch in water and stir into pan. Continue stirring until quite thick. Remove from heat, add yogurt, mix thoroughly. Put the pasta in large pasta bowl, spoon the Stroganoff over and serve. Simple perfection. Slices of butternut squash, dipped in olive oil, sprinkled with rosemary and a bit of salt and roasted until they start to get crispy and caramelized. 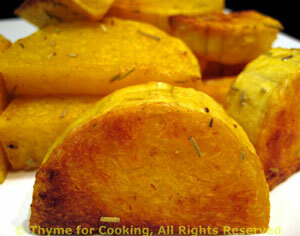 Cut squash into slices about 1/2" (1.25cm) thick. Mix oil, salt and rosemary in a bowl. Add squash and toss well to coat. Spread squash on baking sheet and bake for 15 minutes, 400F (200C). Turn once, bake for 10 minutes longer.